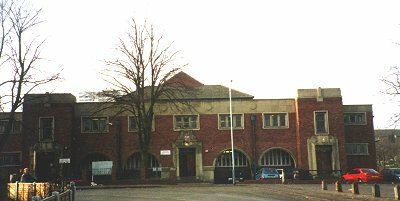 Heath Town's structurally integrated Public Baths and Library - an architectural two-in-one the Librarian believed unique (CMB/WOL/D/LIB/128.6) - was built in 1932 to the design of the Wolverhampton Borough Engineer's Department, after several years' discussion in separate Council Committees, the Art Gallery and Public Library Committee and the Parks and Baths Committee. The building has both architectural and social-historical importance locally, and architectural significance nationally; however the main swimming bath suffers a reportedly endemic leak, and the Council, after taking specialist engineering advice, intends to demolish the entire structure. The building today. Against this background the writer has proposed the building for statutory listing. The decision in favour of listing was announced shortly before this article was sent for publication. The building at it appeared in Wolverhampton Borough Council's Book of the Century, 1948. The complex is broadly in the shape of an E. The vertical stroke represents the wide main facade, on two levels; the lower comprises loggia, central entrance to the baths' vestibule and twin entrances (towards either end) to the Library; the upper houses the Library. The three horizontal strokes represent the main swimming pool (central) flanked (originally) by the other components of "public baths", a children's pool and a public wash-house (equivalent of the modern launderette). 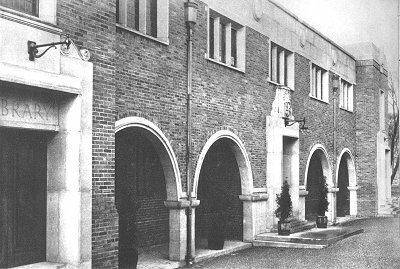 The main facade as it appeared in the Wolverhampton Industrial Development Association's Guide to Wolverhampton, 1934-35. The basic building material is brick, in stretcher bond, with decorative stone-effect dressing on the facade; the principal roofs are pitched, but there are some flat areas (Illustrations 1 - 3). The support structure of the main swimming pool roof is, in architectural history terms, the building's major feature, to which we shall return.